This is the site for Tim Kreider's cartoon, "The Pain--When Will It End?". For Tim Kreider's writing, please see www.timkreider.com. This is Ms. Phelætia Czochula-Hautpänz, the former intern of Mr. Kreider, briefly to assist in his time of sorrow. 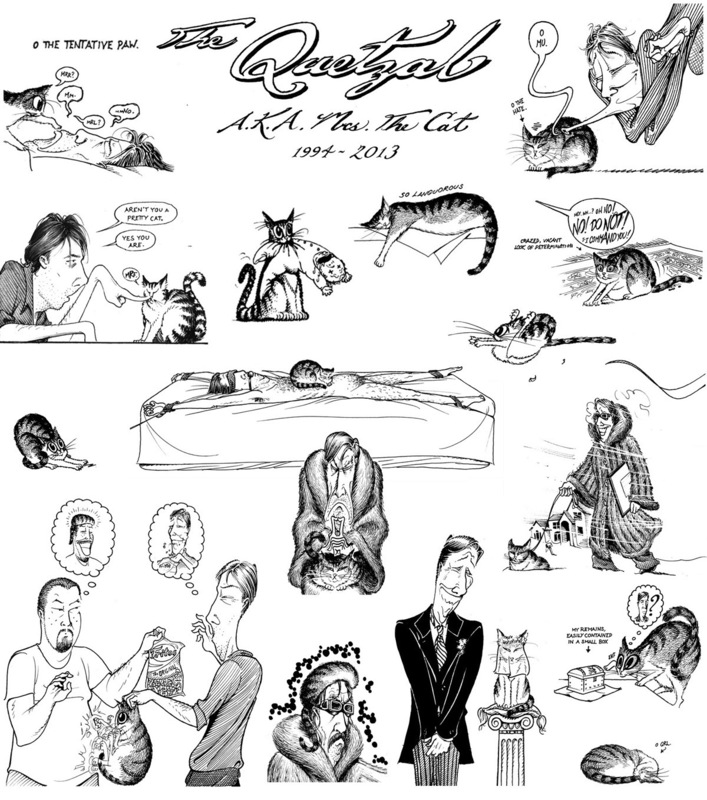 It becomes my duty unhappily to announce the unfortunate death of the famous and beloved cat of Mr. Kreider, "The Quetzal." As the long readers will know, Mr. Kreider owned this animal for almost twenty years and was unhealthy devoted to it, and now finds himself to be inconsolable. I have created as my gift to him this collage of images from his many beloved cat cartoons, which it is hoped readers also will enjoy. Mr. Kreider is now to enter a time of mourning that does not exceed one year. He asks that in lieu of flowers those who wish to express the consolations send drugs or caresses. On a personal note, I would state that although I myself was not fond of the cat, which seemed to consider me a rival for affections of Mr. Kreider and despised me , I considered it a "worthy foe," and now offer my respects with solemnly. 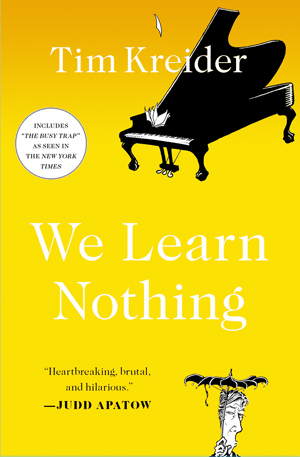 The paperback edition of We Learn Nothing was released April 9th. I'm afraid I'm not likely to make it off the East Coast for this one (unless they're paying for travel), but it can't hurt to ask. "Tim Kreider's writing is heartbreaking, brutal and hilarious--usually at the same time. He can do in a few pages what I need several hours of screen time and tens of millions to accomplish. And he does it better. Come to think of it, I'd rather not do a blurb. I am beginning to feel bad about myself." "Tim Kreider is a writer-artist who brilliantly understands that every humorist at his best is a liberator. Because he is irreverent, makes us laugh, ruffles the feathers of the pretentious and the pompous, and keeps us honest, We Learn Nothing is a pleasure from its first page to the last."" 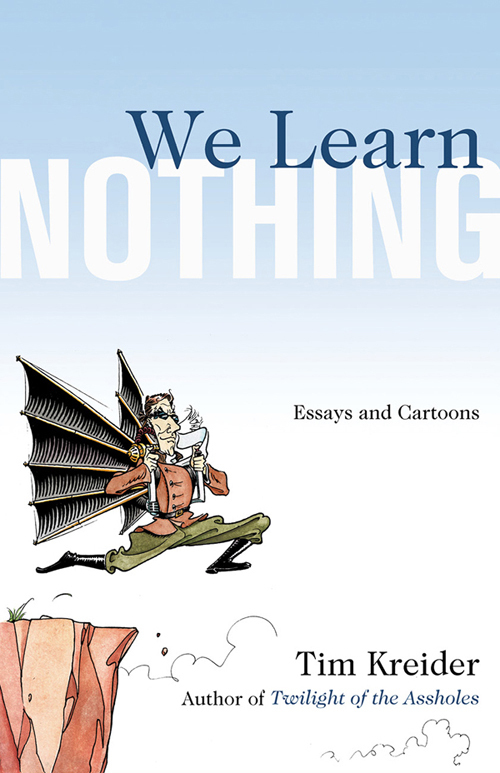 "We Learn Nothing articulated, for me, more human truths than any book in recent memory. When you're done with it, it feels almost like finishing a textbook; you actually feel like you understand how things work a little better." "Earnest, well-turned personal essays about screw-ups without an ounce of sanctimony—a tough trick." Miss a week? Check out the weekly archive here.